Ising models have been studied extensively, and have been applied to language (e.g. Itoh & Ueda, 2004, Stauffer et al. 2007) and, indeed, been applied to bilingualism (Castello et al. 2007). The model imagines each molecule to be a person, and their spin to be their choice of langauge or linguistic variant (typically 2 languages for simplicity and tractability). Speakers interact with a sub-set of all speakers in a social network, just like molecules joined by molecular bonds. At each time step, speakers consider the languages spoken by the people they are connected to and choose whether to stick with their current langauge or change. 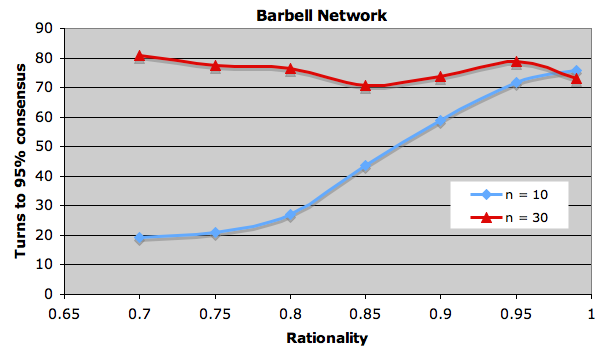 The models can be used to explore when a system will reach consensus – where everybody will speak the same langauge. A rational approach to this problem as an individual is to switch to the langauge spoken by the majority of the people you are connected to. This is the assumption made by most models. However, if the social network is complex, then it may be more rational to consider the system-level situation in order to avoid a Spin Glass dynamic (although we’re assuming some kind of group-level goal, here). 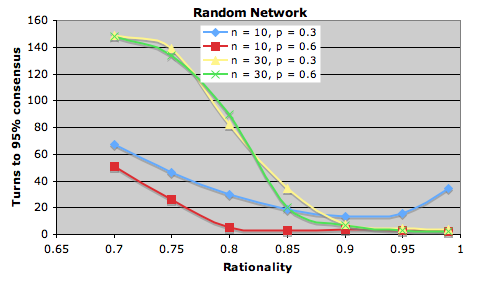 Since speakers in this model have no information outside their immediate connections, one possibility is to just choose a language at random with a certain probability. Let’s call this a speaker’s ‘rationality’ (or local rationality): With a rationality of 1.0, a speaker always changes to the majority langauge. With a rationality of 0.5, the speaker changes to the majority langauge half the time and randomly chooses a langauge the other half. 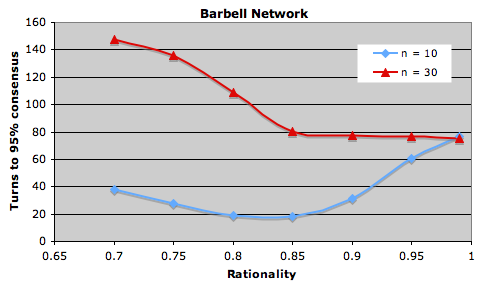 Adding a bit of noise into the model can help resolve frustrated loops and reach consensus. 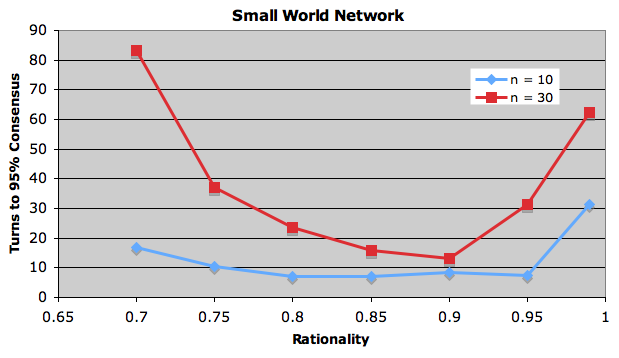 My question is – does the optimal rationality depend on the social network? I built a model and ran some experiments. Let’s assume a number of speakers n in a social network of type k who start with random language settings (2 possible langauges). At each timestep every speaker changes its langauge to the majority spoken by those speakers connected to it (absolute majority, all speakers change simultaneously) with a probability r (the rationality), or choose a language at random otherwise. 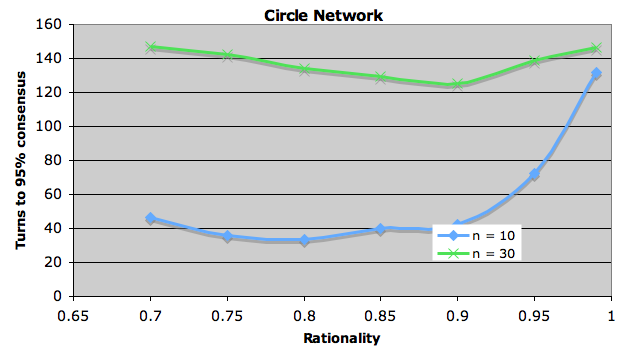 Below are some results showing the average number of time steps to reach 95% consensus for different kinds of network and different levels of rationality (average over 1000 runs, lower scores = more rational setting). 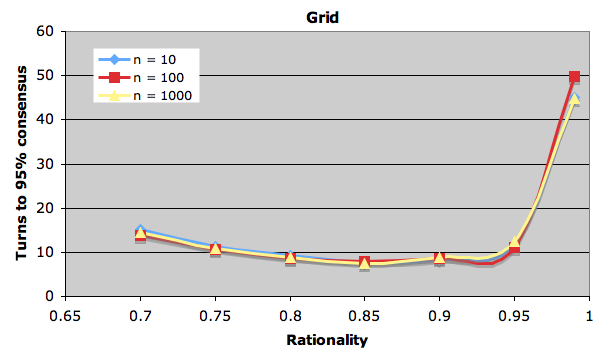 The striking thing is the variation in optimal rationality profiles. Both the type of network and the number of speakers has an effect. Here’s a random network with two density settings (probabilities of 0.3 an 0.6 of a possible connection being made). It seems that the rational approach to cultural co-ordination may be to be not entirely rational, depending on the kind of social network you live in. However, learners may not have access to this information, although some cases might be obvious such as knowing that there are two separate communities. It might be obvious, but if you live in a society where there are two communities that interact more within than between themselves, then it might be a good idea to keep your options open rather than going with the majority. How does this relate to the large literature on Ising Models? Someone has probably done this kind of thing before. The model doesn’t currently allow bilingualism, this could be added (see Castello et al., 2007). 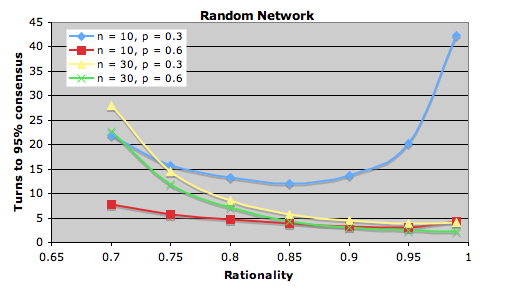 How is the optimal rationality related to more appropriate network statistics, e.g. transitivity, average degree etc? 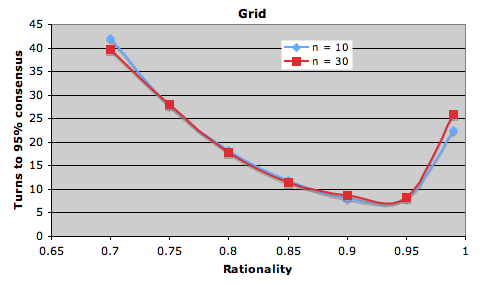 Can an individual learn the optimal rationality? For example, by updating their rationality according to their ‘success’ the last timestep? Or by considering the regularities of the system-wide switches? If so, what is the evolutionary stable distribution? Is this ‘rationality’ too far beyond the cognitive capabilities of the individual? The results above are only based on relatively small sample sizes (1000 runs for each point), a better monte carlo approach is needed, which will either require re-programming in a faster langauge, e.g. C or a mathematical approach with eigenvectors etc. Next Next post: Fun language evolution experiment!